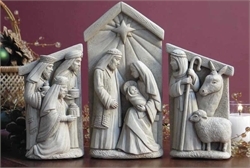 Home > Nativities Sets > USA Nativities > A Stable In Bethlehem - Set Hand Cast Stone Made in U.S.A. This versatile Nativity set can be placed in a tight grouping, or mixed in with other complimentary objects like ornaments and greeting cards. A Stable in Bethlehem set captures an old world, hand made appearance. Display on the mantle, shelf or ledge. This nativity has an Aged Stone Patina on a natural stone base, to replicate soft brown earth tones. Since the color is applied by hand, no two pieces are exactly alike. I love this piece! My husband and I picked it out together, for our home. It's beautiful, humble, and very well made. I love the weight of the stone! It will be the centerpiece of our Christmas decorations for many years to come, and hopefully passed down to our son. So happy to have a Made In USA Nativity Scene!